Microgaming is one of the oldest game developers in iGaming. In fact, it could very well be the oldest. This company is responsible for the creation of dozens of different online gambling games. Their forte is the slots. To that end, Microgaming has made some of the best slots on the market. 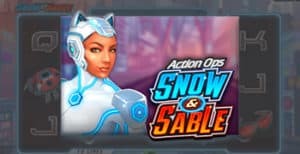 And one of their newest slot games goes by the name of Snow & Sable. You will get to learn more about this game below. We really like the theme of Snow & Sable. It’s about two female superheroes – as far as we could tell. Their names are Snow and Sable. Snow is the ice-cold superhero, and Sable is the all fired up superhero. We couldn’t tell if they are rivals or if they cooperate. But the two of them will give you one bonus if you play. You can read more about it in the next section. For now, you ought to know that the animations in this game are very smooth. And they are beautifully drawn, too. Microgaming is not really known for the strength and beauty of its animations. But this game seems to stand out in their portfolio. Sure, you shouldn’t expect something outstanding and exceptional here. The animations are smooth and cool – and that’s pretty much the extent of this. The music is also good. It’s not a masterpiece but it still manages to keep the atmosphere fun. It enriches the overall experience. It’s not likely to get boring quickly for you. This is, sadly, not the case with most other slot games. As far as slot games go, Snow & Sable is a pretty simple slot. You have 10 pay lines over 5 reels and 3 rows. This means that Snow & Sable is rather old-school in terms of the basic rules. There are other slots that feature thousands of pay lines nowadays. But not this slot. As for the special features, you could get free spins, for one. You could either get 10, 15, or 20 free spins if you get 3, 4, or 5 scatters respectively. And there is a special feature during the free spins. The first and fifth reel will become wild. You could then combine the two different wild symbols to make big wins. 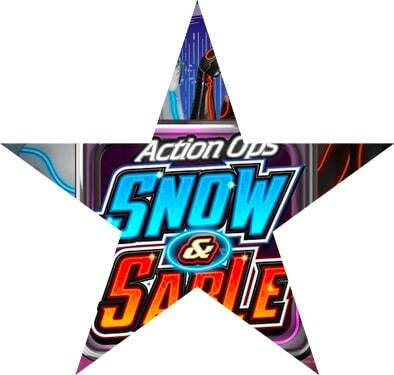 Snow & Sable is a very simple slot game that you are likely to enjoy. Its main charm lies in its simplicity and in the beauty of its presentation. Be sure to try it out and see for yourself.